Amid fresh uncertainty over his planned summit with North Korean leader Kim Jong Un, President Donald Trump said Wednesday that he is committed to pressing for the country to abandon its nuclear program as part of any meeting. North Korea threatened earlier in the day to scrap the historic summit between Trump and Kim, saying it has no interest in a "one-sided" affair meant to pressure the North to abandon its nuclear weapons. But Trump appeared to shrug off the warning saying the U.S. hadn't been notified. "We haven't seen anything, we haven't heard anything," Trump said as he welcomed the president of Uzbekistan to the White House. "We will see what happens." The warning from North Korea's first vice foreign minister came after the country abruptly canceled a high-level meeting with South Korea to protest U.S.-South Korean military exercises that the North has long claimed are an invasion rehearsal. Behind the scenes, White House aides tried to soothe South Korean frustrations over the canceled meeting with the North as they continue to plan for the summit, set for June 12 in Singapore, as if nothing had changed. U.S. officials compared the threat to Trump's own warning that he might walk away from the summit if he determines Kim is not serious about abandoning his nuclear program. The direction from the Oval Office to White House aides and other U.S. national security agencies Wednesday was to downplay the North Korean threats and not "take the bait" by overreacting to the provocation, said a senior U.S. official. The official wasn't authorized to discuss internal conversation publicly and requested anonymity. National Security Adviser John Bolton told Fox News Radio Wednesday that "we are trying to be both optimistic and realistic at the same time." Bolton, who was called out by name by the North for saying that the U.S. is seeking an outcome similar to Libya's unilateral nuclear disarmament, said the personal attack raised the question of "whether this really is a sign that that they're not taking our objective of denuclearization seriously." 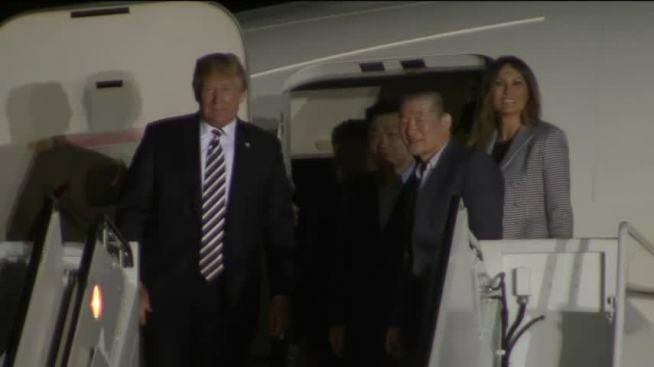 In its commentaries published through the state-run news agency, North Korea steered clear of criticizing Trump himself and Secretary of State Mike Pompeo, who last week met with North Korean leader Kim Jong Un for the second time in little more than one month and brought home three American prisoners. That suggested it still wants the summit to go ahead. But it also took the opportunity to air its own negotiating position and take aim at Bolton, who has suggested that negotiations in 2004 that led to the shipping of nuclear components to the U.S. from Libya under Moammar Gadhafi would be a good model for North Korea as well — although Gadhafi was deposed seven years later following a NATO-led military campaign. The North on Wednesday described that proposal as a "sinister move" to bring about its own collapse. North Korea may have also been responding to aims for the summit aired by Bolton and Pompeo in Sunday morning talk shows last weekend. Bolton told ABC that denuclearization means getting rid of all the North's nuclear weapons, dismantling them and taking them to Oakridge, Tennessee, where the U.S. developed its atomic bomb during World War II and retains a nuclear and high-technology research laboratory. Bolton added that North Korea would have to get rid of its uranium enrichment and plutonium reprocessing facilities, reveal their weapons sites and allow open inspections. The toughest of North Korea's statements was issued in the name of Kim Kye Gwan, who was a leading negotiator of an aid-for-disarmament deal that collapsed under the G. W. Bush administration at a time when Bolton was serving as undersecretary of state for arms control and North Korea was suspected of secretly seeking to enrich uranium. The State Department emphasized that North Korea's leader had previously indicated he understood the need and purpose of the U.S. continuing its long-planned exercises with South Korea. State Department spokeswoman Heather Nauert said the U.S. had not heard anything directly from North or South Korea that would change that. Press secretary Sarah Huckabee Sanders said earlier Wednesday that preparations for the summit were ongoing despite the cancellation threat and that Trump is hopeful the meeting will still take place. "If it doesn't, we'll continue the maximum pressure campaign that's been ongoing," she told Fox & Friends. Oregon Democratic Sen. Ron Wyden said he is concerned that talks are "really being oversimplified" by the White House. "This is not a like condo deal where two people sit down and hash out a number of outstanding issues and then they say 'Well, some lawyers can write it up,'" he said.